Let's face it, it's been an a very unusual start to the 2012 MLS Season for the Houston Dynamo, but come May 12th, Dynamo fans will likely decide this unusual start was worth it. In just over three weeks, the latest jewel in the Houston stadium scene will open in the east side of downtown, BBVA Compass Stadium, the new home of the Houston Dynamo, gets its hard opening on Saturday May 12th when the Dynamo host DC United in a home of their own. Gone are the days of using Robertson Stadium on the University of Houston campus, this season the Dynamo will lay claim to being the first Major League Soccer team to have their own stadium in a downtown locale. 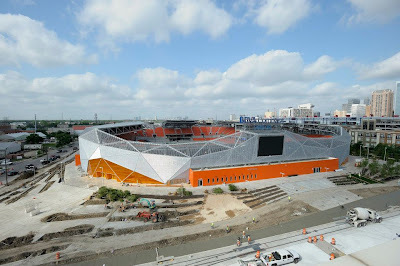 In order to accommodate the construction schedule, MLS sent the Dynamo on an extended road trip to start their season. When May 12th rolls around, the Dynamo will have played 7 away matches. While this appears to be a daunting task for any MLS team, though not a new task since both the Philadelphia Union and Sporting Kansas City have dealt with similar circumstances, the Dynamo have handled it well, already besting their desired goal after only 5 out of said 7 matches. Via several interviews, the Dynamo have indicated their goal was to pick up at least 7 points during this 7 road game stand. With last Saturday's 2-2 draw with the Crew in Columbus, the Dynamo now sit in 4th/5th place (tied with the Chicago Fire) on the Eastern Conference table with 8 points. While the Dynamo are substantially below Sporting Kansas City, who have run off with 21 points out of 8 matches, things are going all right for the Dynamo who still have 3 games in hand against Kansas City. 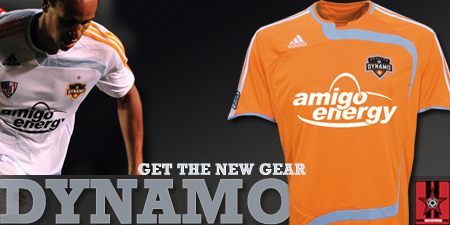 This weekend the Dynamo face DC United, the number two team in the East, with 12 points, and then the head to New Jersey to face the RedBulls on Saturday May 9th, before making their return to Houston for their first match at BBVA Compass Stadium when they host DC United in a sold out match on May 12th.